Enjoy my Textured Circles blanket pattern! I used two strands of worsted acrylic to make this blanket and a size 10mm hook – yarn and hook are optional but will greatly affect final size. Mine is 16 motifs and 68″ square. 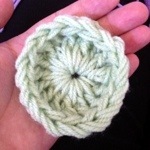 Note: This square is a slight modification of the Circle of Friends Square by Priscilla Hewitt (Ravelry).